December can be a very busy time of year—especially in the world of social media. This month, Twitter introduced live video and then upped the ante with live 360 video—a feature Facebook also released in December. Meanwhile, Instagram hit 600 million users and added new features to Stories while Snapchat launched Group Chat and custom sticker creation tools. Don’t worry about having missed anything in amongst the holiday parties and festive festivities. We’ve rounded up all the updates—big and small—from the major social platforms to ensure that you don’t miss a thing. On December 14, Twitter introduced live video, powered by Periscope. Users can now create and Tweet live video from the Twitter app. To start a live broadcast, users simply need to compose a Tweet then tap LIVE. The button brings them to a pre-broadcast screen so they can frame their shot before hitting Go Live to start broadcasting. Anyone on Twitter and Periscope can watch a live video, comment and send hearts by tapping the screen. The update is available on Twitter for iOS and Android. On December 16, Vine published a post about the future of the service following the October announcement that the app was being shut down. The post explained: “In January, we’re transitioning the Vine app to a pared-down Vine Camera. With this camera app you’ll still be able to make six-second looping videos, and either post them directly to Twitter or save them to your phone.” Additionally, Vine said it would be introducing a feature to make it easy for a Vine user’s followers to follow them on Twitter as well as the ability to download Vines through the app or the website. On December 28, Twitter introduced live 360 video. When users watch videos marked with a LIVE 360 badge, they can move their phone or swipe the screen to change what they see. While any user on Twitter or Periscope can watch live 360 videos, only select partners currently have the ability to start a 360 broadcast. On December 8, Facebook announced several updates to their lead ads offering, which was initially released a year earlier. Advertisers can now add custom disclaimers, use videos, or add a context card to provide people with more information before they sign up. Additional updates make it easier to run and measure campaigns as well as manage leads. Facebook also said it plans to roll out more features in the coming months to make lead ads even more powerful. 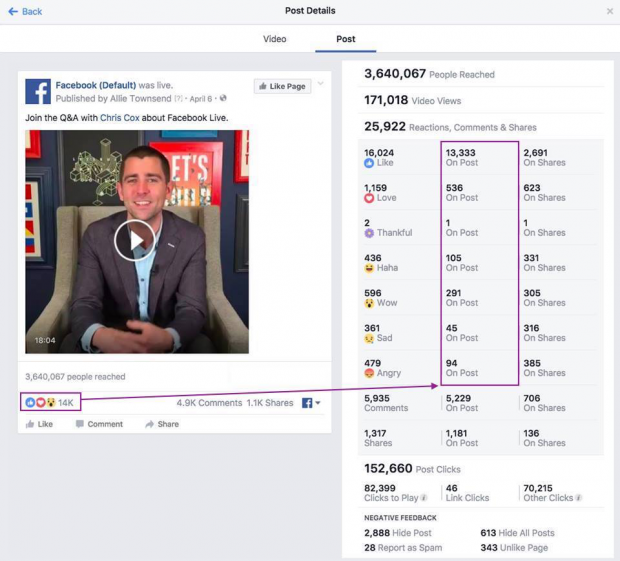 They’ve identified a discrepancy between the counts for the Like and Share buttons via the network’s Graph API and when people enter a URL into the search bar in the Facebook mobile app. The company is working to resolve this issue. The network launched the new feature with a Live 360 video by National Geographic, broadcast from the Mars Desert Research Station facility in Utah, on December 13. 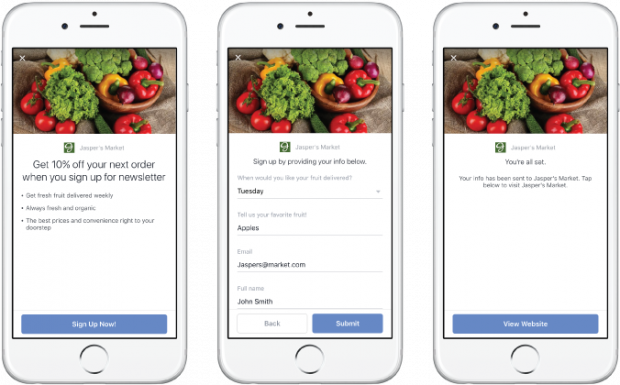 The feature will be available to more Pages via the Live API in the coming months and Facebook says it plans to roll it out more broadly for all Pages and Profiles in 2017. On December 13, Facebook launched the Facebook Parents Portal, which features new resources for parents on the network. The company explained: “Our goal is to help foster conversations among parents and their children about staying safe online… Whether you have an account or your teen does, we’ve compiled some basic information to help you get the most out of your experience and help your child navigate theirs.” The site includes step-by-step videos and is available in over 55 languages. They made it easier for users to report a hoax. They’ve partnered with third-party fact checking organizations (signatories of Poynter’s International Fact Checking Code of Principles) in order to flag stories as disputed. Facebook explained: “If the fact checking organizations identify a story as fake, it will get flagged as disputed and there will be a link to the corresponding article explaining why. 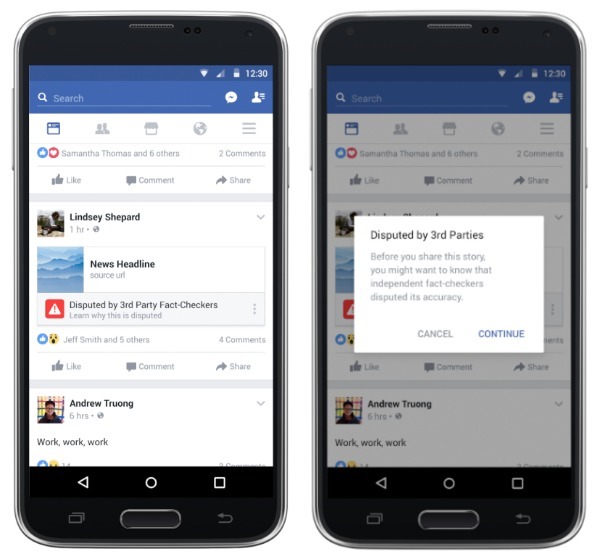 Stories that have been disputed may also appear lower in News Feed.” Users can still share these stories, but when they do, they’ll see a warning that the story has been disputed. Flagged stories also cannot be made into ads or promoted. They’re going to test a new News Feed ranking signal to better rank stories that people are less likely to share after reading. They’re taking several steps to reduce the financial incentives for creating and disseminating fake news. They’ve eliminated the ability to spoof domains, “which will reduce the prevalence of sites that pretend to be real publications.” And they’re analyzing publisher sites to detect where policy enforcement actions might be necessary. 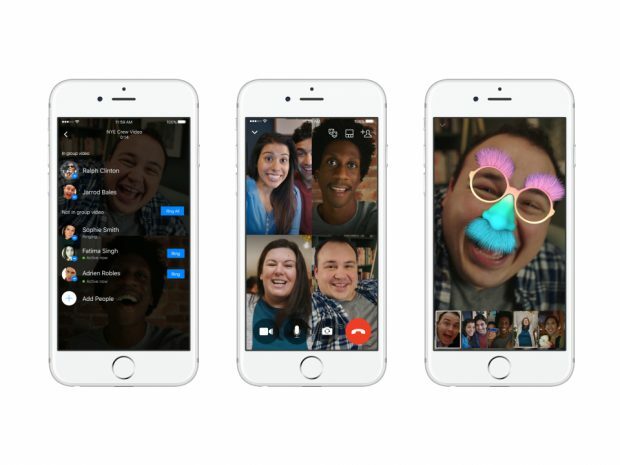 On December 19, Facebook rolled out video chat in Messenger groups. Users can see up to six people at a time, though groups as large as 50 can tune in or join via voice. To start a video call, simply open an existing group conversation (or create a new one) and tap the video icon in the upper right-hand corner of the screen. Everyone will be notified and each person can join when they’re ready. Users can also choose to directly ring a couple of people or the whole group. The new feature is available worldwide on Android and iOS devices as well as through the desktop version of Messenger. The program will feature messages about a specific event or moment at the top of News Feed. 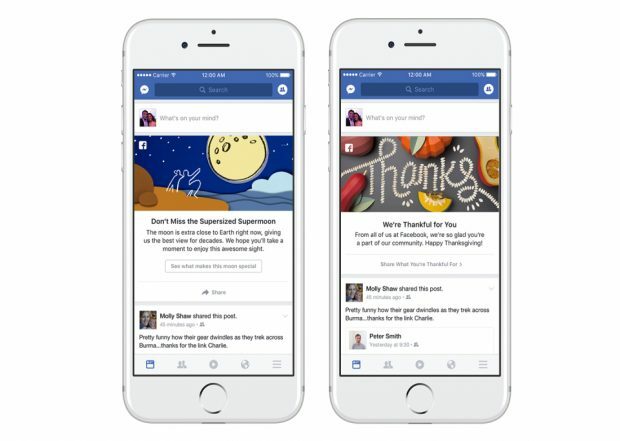 In the U.S., Facebook recently used the program to encourage users to share content about topics like the supermoon and Thanksgiving. On December 20, Facebook introduced Live Audio, a new option for users to tell a story with sound rather than imagery. 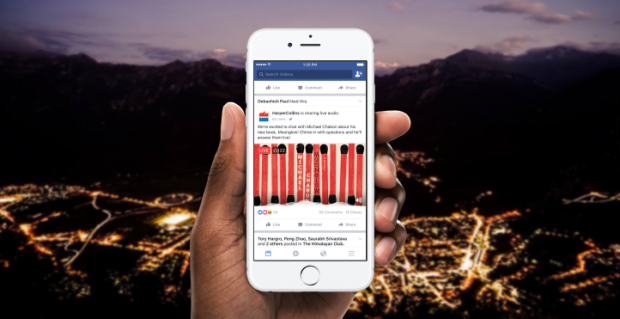 Facebook explained: “From interviews to book readings, we’re excited about the layer of interactivity that Live Audio brings to both the broadcaster and listener.” As with Live Video, users can discover Live Audio content in News Feed, comment, leave reactions in real time, and share with their friends. Android users can continue listening to Live Audio even if they navigate away from the app, while iOS users can listen as they browse other parts of Facebook. The feature is being tested with several partners, including BBC World Service, LBC, and Harper Collins. They began to roll out a way to turn comments off on any post. This feature was previously only available to select accounts. They introduced the ability to remove followers from private accounts. 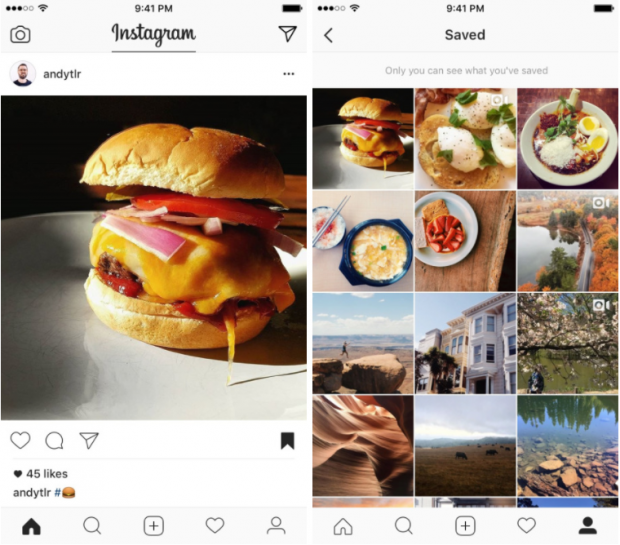 On December 14, Instagram rolled out Saved Posts, giving users the ability to save posts to revisit later. To save a post, simply click the bookmark icon at the bottom right of a post. Saved posts will appear in a new tab in users’ profiles. They are only visible to the user. 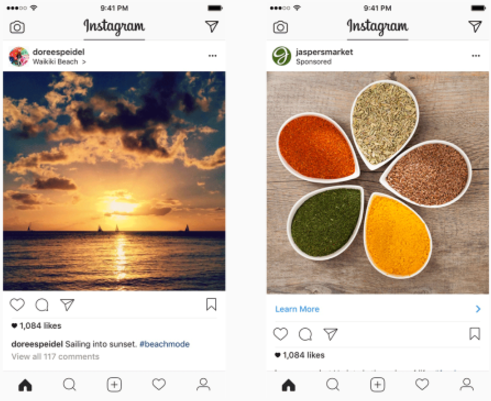 The feature is part of Instagram version 10.2, available for iOS and Android. On December 15, Instagram announced that the platform has 600 million users. As noted in the post, 100 million of those users joined in the past six months alone. The platform announced 500 million users in June 2016. Mid-way through December, Instagram introduced a new look for posts. The new design moved all content to the left-hand side of the header to streamline the look of posts. The update also affects ads: the Sponsored label will now appear under the profile name. There will also be a new menu icon on the right side of the header which, when clicked, will activate hide or learn options for ads as well as a menu of sharing options for organic posts. On December 20, Instagram added several new features to Stories. 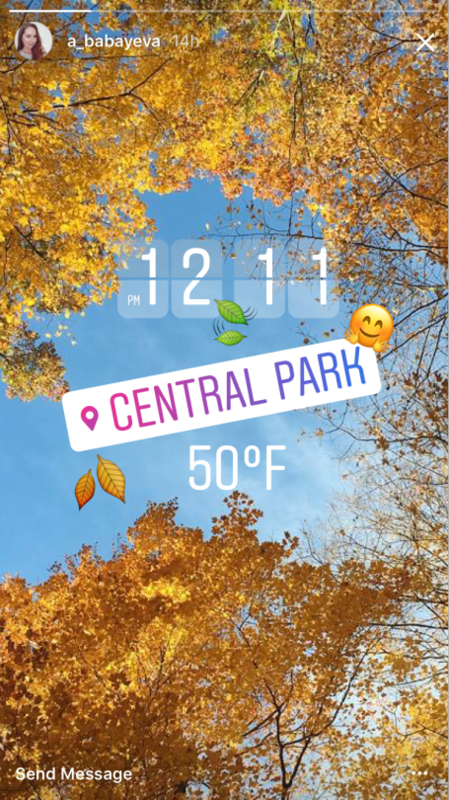 Users can now add stickers to posts to add context such as the weather, current time, or location. Stickers are available in a variety of styles and can be moved and resized to fit the Story they’re being used on. Users can add as many stickers as they like to their Instagram Story. Instagram also rolled out a new hands-free option to give users the ability to start recording a video with a single tap. Additionally, users can add as much text to a photo or video in their Story as they want. Choose between left, center, and right justified as well as slider sizing options and automatic text wrap. The updates are available as part of Instagram version 10.3 on iOS and Android. In an exciting update for brands, business accounts can now save their entire Story from the past 24 hours to camera roll as a single video. This feature is available in iOS. 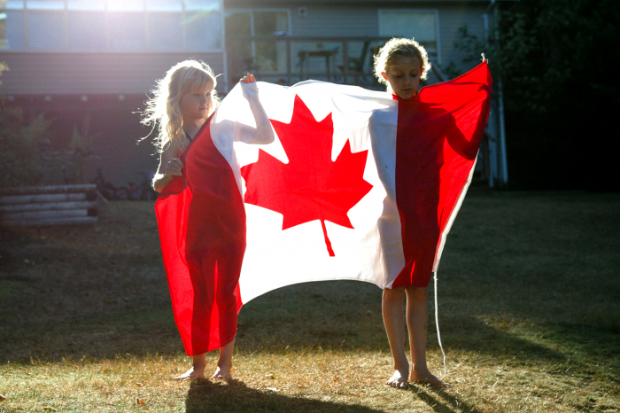 On December 1, Pinterest announced that they’re expanding Promoted Pins to Canada. First launched in 2014 in the U.S. and made available in the U.K. earlier in 2016, Promoted Pins are Pinterest’s answer to ads. On December 12, YouTube expanded their Creators for Change program. 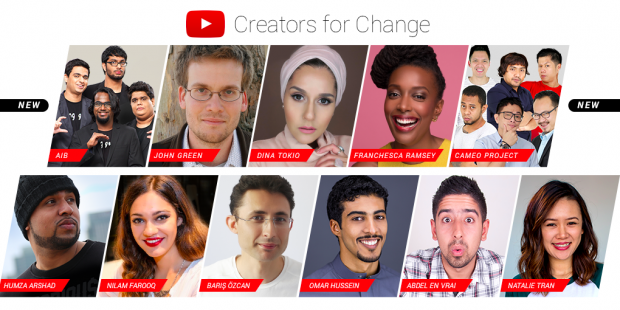 Initially launched in September 2016, Creators for Change is “a global initiative dedicated to amplifying (and multiplying) the voices of YouTube creators who tackle division and hate with videos and stories of hope, connection, and understanding.” YouTube has launched a website for the program and announced new ambassadors. On December 6, LinkedIn introduced conversation starters in Messaging to make it easier for users to break the ice. There are several types of conversation starters, including updates on a connection’s professional activity (such as new jobs, work anniversaries, or recent publications), shared experiences (such as working at the same company or joining the same group), and shared connections. On December 6, Hootsuite updated its bulk composer feature to make it even easier for users to schedule messages. The new composer sends alerts about any errors found in specific messages and allows users to add images to messages and customize link previews prior to scheduling. Find out how bulk scheduling can save you time and learn how to schedule up to 350 messages at once. 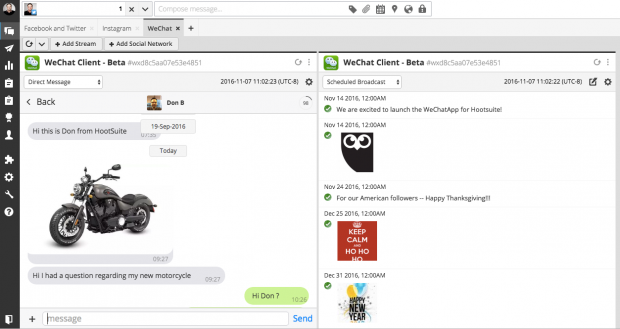 At the end of 2016, Hootsuite introduced a new WeChat app in the App Directory. Hootsuite Enterprise users can now send or schedule messages, engage followers, and manage their brand’s WeChat presence directly from the Hootsuite dashboard. Learn more about how to use WeChat for business in our guide. On December 13, Snapchat introduced Groups, a new feature that allows users to communicate with up to 16 friends at once. Users can create Groups while sending a Snap or when they’re making a new Chat. When a user’s friends are present in a Group Chat, their names will be displayed at the bottom of the Chat. Messages sent to a Group will be deleted after 24 hours by default. Snaps sent to the Group can be opened and replayed the same as regular Snaps—once by each recipient. On December 13, Snapchat also introduced several new creative tools: Scissors, Paintbrush, and Shazam. With Scissors, users can cut out part of a Snap in order to turn it into a sticker. The Paintbrush feature can be applied to Snaps in Memories. Additionally, users can also now use Shazam to identify songs while in the app. Keep up with all the latest social news by using Hootsuite to keep track of all the accounts you follow. Try it free today. For all the same reasons marketers love social media—its ease of use, low cost, and high number of users across the globe—so too do cybercriminals and scammers. As marketers continue to leverage social media, security becomes increasingly more important. The biggest companies on earth are turning to social media to engage with customers, drive business, and have their voices heard. There are millions of dollars being made on social media each day—making it a prime target for exploitation and extortion. Most social media pros encounter scams or fake profiles frequently enough that they are not easily fooled. But can you the same for your executives? For every person in your organization? For your customers? According to the cybersecurity firm Norton, 40 percent of social media users have fallen victim to cybercrime on social media, and one in six users believe their accounts have been compromised. A recent McAfee study found that employees experience far more cybercrime on social media than any other business platform. That includes email, the place most people usually keep their eyes peeled for scams and “phish-y” messages. When it comes to social media, employees, customers, and brands themselves all face security risks. Corporate-owned accounts are the flagship for any modern organization operating on social. For many companies, they are at higher risks than a website because social profiles are so visible and valuable. An account impersonating a brand isn’t necessarily bad. But anything that account does, especially engaging with customers, can impact the actual brand. On the playful side of the spectrum is a parody account, which, depending on the industry, some companies don’t mind. In the middle of the spectrum is an impersonator hijacking your hard-won social media popularity for any sort of shady activity, like piracy or selling counterfeit goods. 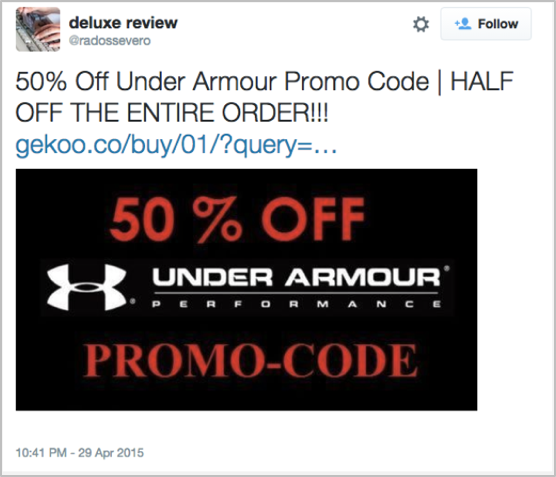 These accounts steal clicks and impressions, confuse consumers and erode your share of voice. On the dangerous end, an impersonator account can engage with customers as if they are the genuine brand and deliver phishing links or malware exploits. The cost here is huge: customers who associate the attack with your brand likely won’t be doing business with you. Losing control of a branded account is every social media marketer’s worst nightmare. It’s happened to the best of them: Associated Press, CENTCOM, Chipotle, the NFL, Delta, Crayola, NewsWeek, and the University of Michigan. Such an attack can turn into a PR nightmare, costs countless dollars in damage control or lost business, and erode customer trust. Everyone at your organization is on social media. You likely have built out policies for users or even employee advocacy programs. But what happens if they click something they shouldn’t or post something out of line? Fake executive accounts, like fake brand accounts, are building blocks for other types of threats. A fake executive may slander the company online or engage with employees at the company to launch attacks (think of a fake CFO account sending a virus disguised as compensation paperwork to new hires via LinkedIn). Spear phishing is the oldest trick in the book. Originally associated with email, spear phishing involves sending a bad link, such as a phishing or malware attack, appended to a carefully crafted message. Both the spray-and-pray approach (attach every trending hashtag you can fit) and the highly-targeted approach (use all the publicly available personal details from the target profile to craft a nastily specific message) are effective on social media. These attacks, if they get as far as breaching a corporate network, can cost huge amounts of money, create bad press, and anger customers. For any marketing team that is not operating their executive’s or high-profile employee’s account, enforcing and regulating internal social media policies is a challenge. Any time an executive says something controversial or off-brand, it’s on the PR team to clean it up. Customers are the lifeblood of any business. Although they exist outside a marketer’s jurisdiction for how they operate on social, they, more than anyone, are worth protecting. Scams can take many forms, depending on the industry. They range from “free iPad!” scams to money-flipping financial scams and fake travel sweepstakes. The associated costs vary as well: direct financial lost, stolen travel points, fake customer support payments, leaked credentials, and more. 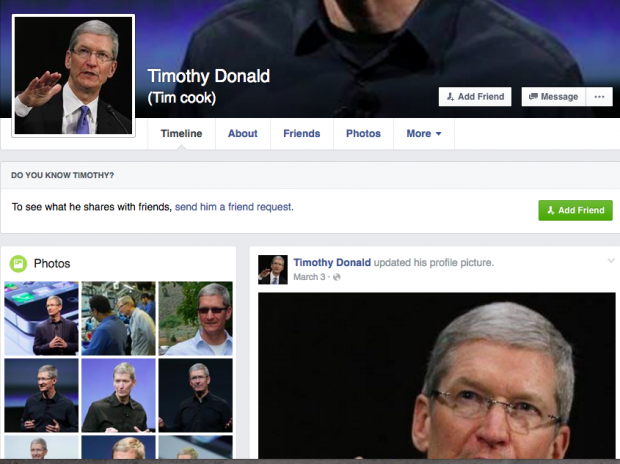 What makes scamming in the social media age so dangerous is scale. 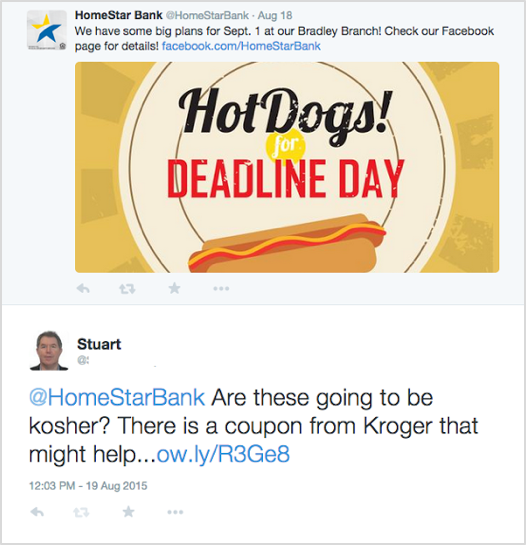 A scammer can exploit an organization’s hashtags (or impersonate their brand outright) to launch a scam aimed at any would-be customer who uses social media. Consider if all the calls to action on your social media advertisements and posts drove to malicious websites instead of content and conversion forms. Social media practitioners are at the forefront in the fight against all these risks. They are responsible for the safe execution of social marketing and for ensuring that the brand and its people are not exposed to threats. In order to do so, marketers should monitor continuously for all varieties of risks and get malicious content removed when necessary. Social media is an ocean of dynamic data and searching it manually is nothing short of a herculean task. Social media is a powerful business driver and an excellent place to engage with customers. Because of these clear advantages make it all the more important to protect your company’s investment in social media. As marketers continue to grow their business on social, they should work to do so safely and securely. The huge opportunity offered by social media is not without its risks. If one of the worst brand Tweets of all time from U.S. Airways has taught us anything, it’s that you can’t control your brand image the way you used to. Brands now carry the baggage that accompanies an ‘always-on’ presence on social media. With third party apps and integrations, you can protect accounts from brand impersonation, customer scams, fraud, and impersonation. For example, with ZeroFOX and Hootsuite, you can automatically identify and remediate risks in your Hootsuite stream. The year was 1939, and a film had just been released to disappointing reception. This flop was American studio MGM’s most expensive production at the time, and recorded a loss of $1.145-million. It wasn’t until a 1956 CBS broadcast of The Wizard of Oz that it finally got the audience attention it deserved. Today, this “flop” is considered one of the best films in history, and is the most-viewed motion picture on television syndication. The Wizard of Oz had the quality content it needed, but was missing one crucial ingredient—an audience. While your YouTube channel might be producing high-quality content, if it isn’t getting audience attention and views you’re missing out on huge opportunities. However, getting these views is easier said than done. We’ve put together the following guide to help you get more views on YouTube—and save your brand from becoming a flop. One of the best ways to get more views is to ask your audience to subscribe to your channel. This helps make sure that they are aware of any new content you post and puts necessary pressure on you to post consistently. The easiest way to get your audience to subscribe to your channel is to provide a clear and simple call to action—whether through your videos or social media channels. Create and share content that your audience will find valuable. Conduct audience research and social media listening to figure out what types of video your target audience will find most interesting. Make sure your videos aren’t just drawn out advertisements for your business, but rather lifestyle and brand-relevant video content. Maintain consistency and ensure you are posting on a regular basis. Don’t leave your audience hanging, but rather become a part of their schedules and online habits with your videos. A request to subscribe seems pretty straight-forward, but Content Verve found that if you use first-person phrasing on your button (i.e. “Make me a social media expert! Subscribe now”) you could see a 90 percent success rate over other phrasing. Keep it simple and straightforward, and you should see those subscriptions—and views—grow. Your channel is a direct representation of your brand, and you want to make sure that customers see you at your best. Don’t present them with a messy, disorganized YouTube experience, but rather a well-curated and well thought-out channel. One of the best ways to do this is to create playlists to organize your content. You can create playlists, whether of your own original content or curated content from other relevant makers and brands, and help your audience find more of the videos they want to see. Find a video you want in the playlist. Under the video, click Add to and then select the black plus sign. Use the drop down box to select your playlist’s privacy setting. Don’t make it private, as your audience won’t be able to find it when they search YouTube. Besides playlists, there are many other ways to increase YouTube views. To get more views on your YouTube videos, think about how your target audience might discover your content. Ask yourself what kinds of keywords they would use when conducting a search, and what sort of video titles would they click on? These are the questions you need to consider when filling in the metadata for your video to increase discoverability and views. Metadata includes the video title, description, tags, category, thumbnail, subtitles, and closed captions (if applicable). This information helps videos get discovered more easily, and adds important context to your content. Be short and sweet with your video’s metadata. Instead of describing every component of your video, use a few words to sum up the main idea. Use subtitles and closed captions. These help broaden your audience to non-native language speakers and those who are hearing-impaired. Add a translated description to your video for international viewers who might speak another language. Follow the rules and don’t use clickbait tactics. Think about the kind of information that you would consider misleading if you were searching for something. YouTube provides a great video from their Help Center. One key area of your metadata that can make or break your chances of getting a view is the all-important thumbnail. Just like you, your target audience is deciding whether to click on your video based on a small visual preview of the content. There are many elements to a YouTube video that can increase your views. With annotations, you can add text, links, and hotspots (or “spotlights”—areas that show text when the user moves the mouse over them) over your video. As YouTube explains, “When used correctly, annotations can improve engagement, viewership, and help you grow your audience.” If you need a refresher on how to add annotations to your videos, YouTube provides a great guide. Annotations encourage your audience to engage with your videos, and will help you effortlessly hit that 30-second mark. One of the best ways to attract new viewers to your content is with incentives such as campaigns and contests. With a YouTube contest, you can reach not only your current audience, but those who found your channel after seeing the contest entries and the contest announcement itself. Your audience is much more likely to share your content if there is an incentive involved, so a contest is a great way to increase your YouTube views. There’s no magical recipe to guarantee more views on YouTube, but with the above tactics and best practices you’ll be on the yellow brick road to business success. Founded by William Penn in 1681, Pennsylvania is a state rich in history. Visitors and residents alike can see where the Declaration of Independence was signed in 1776. The ValuePenguin team analyzed data for 227 communities in Pennsylvania with populations of at least 10,000 people to determine the safest communities. Final crimes ranged from 132 to over 7,900, so it is important that people research a community before they move there. Four out of the top five are part of the Philadelphia metro area. All of the communities had incomes above the state’s median household income; however, some of the places were significantly more affluent than Pennsylvania as a whole. These cities have an average crime score of 190, which is 84% lower than their typical peer in the state. With some of its lowest total violent and property crime rates, these five are the safest places in the state. This community of slightly over 10,000 people is 15 miles west of Philadelphia. It had the lowest rate of property crime of any city in this study. Upper Providence Township is an affluent community with a median household income of $107,311 which is more than double the median household income of the state. This place is in Delaware County, so residents have the Brandywine Battlefield and the John Heinz Wildlife Refuge to visit nearby. The second safest place is another small community that is part of the Greater Pittsburgh area in Allegheny County. It is the lone community in the western part of the state in the top five. South Park Township had the second-lowest rate of property crime in Pennsylvania. The median household income of $69,365 was $16,000 a year above the state’s median income. Opened for settlement around 1700, Buckingham Township has a long, rich history. Residents can visit many nearby historical sites such as Washington Crossing Historic Park, site of George Washington’s midnight crossing of the Delaware. It is the safest city in our mid-sized category with low rates of both violent and property crime. Buckingham Township is very affluent with a median household income ($119,620) and homeownership rate (92%) well above the norm for Pennsylvania. Like Buckingham Township, this community is also located in historic Bucks County. It is the largest place in the top five with a population just under 40,000 people. Northampton Township has low rates of both violent and property crime. Of note, it recorded just six violent crimes for the year surveyed. It is 12 miles northeast of Philadelphia and is home to a very affluent population with a median household income of over $106,000. The final place in our top five is a small community of just over 10,000 people in Chester County. Willistown Township boasts of its great location: approximately 20 miles from Wilmington, Delaware and 20 miles from Philadelphia. Founded in 1704, English Quakers were among its first settlers. There were only two violent crimes recorded in 2014. This community has a median household income that is over $48,000 higher, per year, than the median household in Pennsylvania, and it has a more educated population — 62% of its residents have a bachelor’s degree or higher — than the state as a whole. Below is the entire list of places that we included in our “Safest Places in Pennsylvania” study. They are listed from the safest to the least safe, according to our analysis. The calculation for the crime scores can be found in the methodology section below. Take a look at the graph and see where your hometown ranks. When people pick a place to live, they want a consistently safe place. Upper Providence Township in Delaware County was the safest place in both ValuePenguin’s 2015 and 2016 studies. It had low rates of violent and property crimes in both years. Buckingham Township was also very consistent. In both 2015 and 2016, it was the safest mid-sized community and ranked number three in the top five. This community delivers safety for people and their property. The research results were consistent in another way. In both 2015 and 2016, four out of the top five safest places were in the eastern part of the state. Those four communities were all part of the Philadelphia metro area. We removed all cities with less than 10,000 in population. The FBI had data for 964 towns, 737 of which were under 10,000 in population. We standardized the remaining data to reflect violent and property crimes per 100,000, to account for population. Then, we aggregated a “crime score” by weighting violent crime at 80% and property crime at 20%. Though property crime is more prevalent, we figured that violent crime is more concerning to town residents. Then we adjusted the crime score for population size, giving more slack to larger cities. Finally, we ranked the cities based on their crime scores. Here is a complete table of all cities included with their ranks, making it easier to compare different cities. See where your city lies! North Coventry >> When the new Gabe’s store opens at the Coventry Mall on Saturday — it will represent the culmination of nearly a year of work by mall owner Pennmark Management Co. The plans to bring Gabe’s into the mall were announced in October. Located in the former Sears store, Gabe’s occupies 45,000-square feet, according to its parent company. The store needed to be divided — to accommodate Gabe’s and Limerick Furniture. Painting and construction soon followed, along with the hiring and training of a staff of about 100. Owned by Gabriel Brothers Inc., the North Coventry Gabe’s is the first in the tri-county region, and only the third in Pennsylvania. The chain offers famous brand apparel, footwear and accessories, as well as home décor, electronics and toys, at up to 70 percent off department store prices. It is the fourth anchor store for the Coventry Mall. Following a soft-opening on Thursday, the store will officially open at 8 a.m. Saturday with a ribbon cutting and giveaways for the first 200 shoppers. Additional giveaways will take place throughout the day. At about the same time the Gabe’s deal was announced in the fall, the mall’s operators unveiled plans for a face-lift for the mall — which includes the construction of a new mall entrance adjacent to Gabe’s. That entrance is still under construction, and Batten expects work to be completed within the next 30 days. “When you drive up to the mall we want it to look like the front of the mall,” he said. According to Batten, there is not an entrance to the mall from Gabe’s, but he adds the new mall entrance will give easy access to the mall for Gabe’s shoppers. The goal for the area near the new entrance is to create a courtyard with outdoor seating for a planned restaurant. Pennmark Management Co. CFO Bob Sichelstiel said in an interview Thursday that his company is interested in finding a brew pub operator for that space. When Pennmark Management Co. took possession of the mall last April, CEO Don Cafiero said at the time that the main goal was to fill vacancies and bring more people to the mall. When Pennmark acquired the property, the mall was about 65 percent occupied, according to Batten. Today, the figure sits at about 88 percent. In addition, 11 new vendors have been added, and the former arcade has been turned into a community meeting room for area community groups. Batten said that two additional large tenants will soon be added to the mall complex. Lomax Carpet and Tile will be opening in late spring in the former Superfresh store — occupying 40,000 square feet. And he said Thursday that Pennmark is just days from signing a deal that will bring a medical facility into the 30,000-square-foot former Ross Dress for Less store. Because the deal isn’t signed, neither Batten nor Sichelstiel could say specifically who will be taking the space. “However, this will be a full 30,000 square feet of medical offices, multi practices including pediatrics, dental, Ob/Gyn, an imaging center,” he said. Sichelstiel said he believes his company’s experience with medical offices helped when it came to getting a medical facility at Coventry Mall. “We can speak the language, we’ve done it before. Plus it’s also good for the community,” he added. As for foot traffic, Batten said it is definitely up in the past 11 months. “Some of that is due to events, some due to other things. Is it where we want it to be? No, but look at where we came from and where we are today and there is definitely an increase,” he said. Sichelstiel said the mall has been holding a number of events to help bring in customers — some of which have worked better than others. But the key, he said, is to keep holding them. “We have made some mistakes and done some great things. For the things that didn’t work as well, we can tweak them and make them better,” he said. Is Pennmark pleased with where Coventry Mall is right now? “We wish it was going faster. But there is so much leg work and details to make these things work. We are pleased we have good things to talk about. We are pleased with where we are,” Batten added. Coventry Mall is the first mall that Pennmark has taken on; the company owns and manages a portfolio that includes 2 million square feet of retail, office and flex space across Pennsylvania, New Jersey and Ohio, including eight shopping centers in Pennsylvania. I have recently had a lot of friends from 18 – 35 years old ask me for advice on whether to start their own business. I have plenty of advice to give. If they aren’t ready to take advice or hustle it doesn’t matter . The more I experience owning and running a business the more I am learning to cut the BS. A person I really love for giving it cut and dry is Gary Vaynerchuk. If you haven’t listened to his interviews or speeches get on it. What the hell are you waiting for? Larry King: When do you know you’re ready to start a business? Gary Vee: If you’re asking that question you’re probably not ready. I believe that a pure bred entrepreneur suffocates in the notion of doing anything but running their own business. Here’s a little video you should watch. Reach the audience that you want to complete your form with our targeting options. You can use demographic and interest targeting or more advanced options like custom audiences or lookalike audiences . Best Practice: To collect high quality leads, target a lookalike audience based on your best customers. If you target audiences similar to your existing customers you can reach the people who will provide the most value to your business. Automatic bidding, where the ad auction system will adjust your bid to generate the most leads possible within your budget. Manual bidding, where you set the monetary value of each lead. Bidding Best Practice: When optimizing for leads, it’s important that you bid high enough to get sufficient reach for your ad. If you know how much each lead is worth to you, use manual bidding and be sure to bid no less than your true cost-per-lead (the true the maximum you can pay for a lead and be ROI-positive). Lower bids may reduce the number of people in your target audience who see your ad. Grab attention in News Feed with engaging creative and illustrate why a person should complete your lead form. Now you can show off all your business has to offer with carousel and video creative in your lead ad. Best Practice: Use one of the more engaging creative formats like carousel or video to stand out and capture attention. Best Practice: Keep your form short with very few open-ended questions. Long forms and open-ended questions that require typing increase the work required for people which increases chances they lose interest and abandon your form without submitting it. As an alternative to open-ended questions, try providing multiple choice answer options to collect similar information. Immediately following up on your leads can help drive the best conversion rates and ensure your budget is spent efficiently. You can access your leads by downloading them from your Page or receive them automatically by integrating your email marketing or customer relationship management (CRM) tools with lead ads. Check out the latest list of integrations available. Best Practice: Make follow-up easy by integrating lead ads with your marketing tools so when someone completes a lead ad the information automatically appears in your CRM tool or is added to your email list. Learn how. Do you have an obsession with those Wawa Hoagies? What is “Wawa?” Besides a Native American word for the Canada goose, Wawa is a convenience store that has a dedicated fan base. There are stores only in Pennsylvania, New Jersey, Delaware, Maryland, Virginia and Florida. Wawa has recently expanded into the Florida area. They actually opened a couple locations near our Florida branch in the Sarasota area. This always puts a smiles on my bearded face when I am down south and see that Wawa sign lit up. A little piece of Philadelphia near the beaches I grew up on. Rapper Aaron Out has recently professed his undying love for these deliciously LIT Hoagies that you can get at 4am. A new study has confirmed what frequent visitors to convenience stores already knew: Wawa is the best. Seven thousand consumers, polled by Market Force, gave Wawa a “composite loyalty score” of 68 percent, ahead of other stores like QuikTrip (62 percent) and Sheetz (59 percent), and it also nabbed the top spot in fresh food category. Here are some things you might not have known about the absolute best place on earth to buy a hoagie, iced tea, and Tastykakes. 2. In the early 1900s, many children were becoming sick from drinking raw milk, so Wood had doctors vouch for his product. The “doctor certified” milk, delivered directly to a customer’s home, made the business a huge success. 3. As the milk delivery business dwindled in the 1960s, Wood’s grandson, Grahame, noticed that customers were shopping more at supermarkets, and thought Wawa could distribute its products that way. The first Wawa Food Market opened at 1212 MacDade Boulevard in Folsom, Pennsylvania, on April 16, 1964—and it’s still there! 4. The stores were successful in part because convenience stores were exempt from laws that kept other stores closed on Sundays. 5. By 1972, there were 100 Wawa stores open for business. By 1992, there were 500 stores. This year, there will be as many as 647 Wawa stores. 6. Wawa is Lenni-Lenape for Canada Goose. 7. Want to pronounce “Wawa” correctly? It rhymes with Saw Saw, according to locals. 9. And enough coffee—195 million cups—to fill Shamu’s tank more than 11 times. That signature coffee, introduced in the 1970s, is proprietary, and available only in Wawa stores. Here’s an article about Google trends and how it effects your Search Engine Optimization for your website. Google Trends is a modern tool from Google that assists SEO specialists analyze the reaction of people towards events, happenings and topics from all around the world. People love to search for these items in the internet and they are noted by Google Trends based on the real-time date that those events happened. With the help of Google Trends, you can take a closer look at what interest people these days in an organized perspective with all the logistics and data that you need. Whenever there is trending news, you can use the data presented to you so that you are able to react to it at the right SEO perspective. Google Trends data are pieces of information gathered out of regular Google searches. The data is in anonymous form and are segregated based on keyword listings or categories. This way of segregation makes it easier for people to analyze topic on an SEO point of view. In fact, Google Trends can magnify the data up to the city level or filter it based on real time or not. The real time setting features data from Google searches that happened in the past week or past 7 days. In the non-real time setting, the data presented could go all the way back a few months ago or even several years back. In either setting, this only means that all of the Google searches are kept in a database and Google Trends can look them all up for you. These data sets can be very powerful items for SEO. They give you a clear picture of what people search for in the internet at any time. However, let us also consider that these data sets it relatively new for SEO and it is still not fully utilized unlike other Google SEO tools such as Google Adwords data although they are much related to each other except that the latter is used to look at search volumes only while the former is focused on the much more specific data and dig to searches in its molecular levels. Data and statistics given to you by Google Trends give you the power to analyze a topic over the course of time. Most of these numbers are presented in percentages and you can clearly see how the interest of people fares over time. The percentages represent the fraction of searches done in Google on all topics at a specific time and location depending on the timeline that you are looking at. If you switch that in a regional search for a topic then you’ll find the percentages of search interest in that specific topic on all of Google at a specific time and location. Here is a brief overview of what to see out of these numbers. If you take a look at Google Trends data regarding the 2017 Superbowl 51, you will easily notice that states with the highest interest on the said event are Massachusetts and Georgia. This is because their respective teams played in the said championship game therefore sparking a lot of interest on both states. However, if you look at the raw data then you would notice that the number of searches is far greater in larger areas with higher population but the ratio of searches towards the total number of people is much lesser compared to the two states mentioned above. If you are able to get your hand on the data that Google Trends present in real time then you would be quick enough to react on topics before they become a legitimate trend. You will be able to stay ahead of fellow SEO experts and take advantage of the topic before your colleagues get their heads on it. A lot of SEO experts use Google Keyword Planner when it comes to taking advantage of trends and they only react towards a certain topic whenever they see that a particular keyword or a set of keywords abnormally goes up in terms of search volume. If you come to think of it, an upcoming trend would not have a definite keyword with massive search volume that Google Keyword Planner can recognize yet. On the other hand, Google Trends would already have its hands full on the upcoming trend and if you take advantage of this tool then perhaps you would be the one who will solidify a legit keyword for it out of the content or webpage that you made for that specific topic. Google Trends is definitely a great tool to help you to stay ahead of your counterparts. Since the said tool is not that popular yet, it would be advisable to take advantage and learn the tool in order to maximize its potential for your SEO work before others can. The world of internet marketing is constantly evolving and we will never know what is in store for us in the few years to come. Technology and internet-savvy companies will continuously manufacture programs and tools that will make it easier not just SEO specialist but for everyone who relies on the internet for their work and services. However, as products and tools continue to improvise, there are also some that get left behind because their basic functions are no longer applicable in the current industry or where it is heading. Leaving it obsolete and later on extinct. The most important thing that we have to appreciate is the fact that the continuous influx of tools and applications such as Google Trends help us grow in our internet marketing careers. It makes work a lot easier and it feeds us very detailed information that has never before happened in the history of the internet. Google Trends can still be considered as a relatively young product and its maximum potential is yet to be determined. But the fact that it is already out there with its multiple functions is already a lot to thank for. This program cannot also be considered as stable and its developers may eventually fix a glitch or two after sometime, but the power it has given SEO specialists is very massive and the future is definitely bright for SEO.